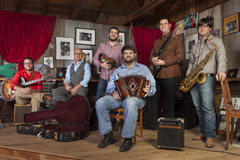 The Revelers, founding members of the Red Stick Ramblers and The Pine Leaf Boys — called “unquestionably the two groups at the vanguard of the Louisiana cultural renaissance” — have joined together to form a Louisiana super-group that combines swamp-sop, Cajun, country, blues and zydeco into a powerful tonic of roots music that could only come from southwest Louisiana. As individuals, they are each in high demand, having performed and recorded with T-Bone Burnett, Natalie Merchant, Linda Ronstadt, Preston Frank, Walter Mouton, Mamadou Diabate, the Duhks, Cedric Watson and Tim O’Brien, to name a few. As a group, they play with a sense of empathy and depth that can only be fostered after years of making music together.